I grew up loving all the “meal helper” products that were first introduced in the 70’s. If you’re old enough to remember the introduction of Hamburger Helper, you may recall how ‘innovative’ it seemed back then. But after college when I was responsible for making my own meals, I realized that some of the “cheesy powders” and other pre-mixed ingredients probably weren’t the healthiest things to eat – especially because I couldn’t tell what was really in them. But it wasn’t just the taste of Hamburger Helper that I loved, it was also the convenience of cooking everything in one skillet. After learning how to cook with whole or less-processed ingredients, I started to create my own homemade version of a “helper” dish which has become my go-to main dish to make any day of the week. It’s hearty, satisfying and filled with ingredients that everybody in the family loves – even my nieces and nephews! I submitted this recipe in the Outlook.com Healthy Recipe Challenge earlier this fall and was excited when it was selected as one of the five finalists. While it didn’t win the recipe challenge (turkey nachos reigned supreme! ), it is a recipe that is so versatile. I can make a large batch on Sunday and have enough for Sunday dinner and four more lunches/dinners throughout the week. It also freezes well for when you need to dive into the freezer to save dinner. In a large skillet, begin to brown the ground turkey on medium-high. Pour in the broth and, using a cooking spoon or spatula, start to break up the meat. Add in the onion, basil and oregano. Stir regularly until the skillet starts to boil. Then add in the edamame and brown rice. Stir until well mixed, making sure there is still enough broth to cover the ingredients. If necessary, turn down the heat to allow for the dish to simmer on the stove’s burner. 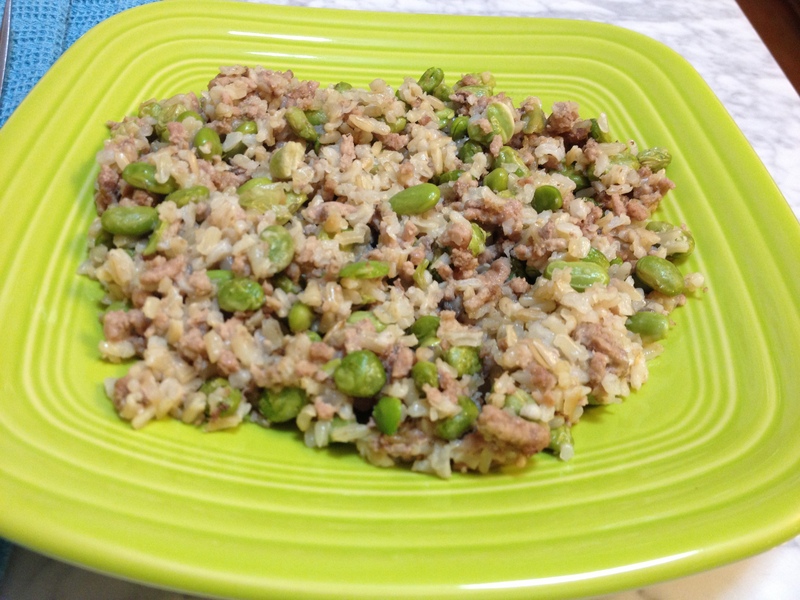 Typically, it should take about 15 minutes or so for the rice and edamame to properly cook and absorb the broth. Stir regularly to ensure even cooking. Watch the level of broth in the skillet. As soon as it almost disappears, remove the skillet from the burner and stir in the cream of mushroom soup until well blended.